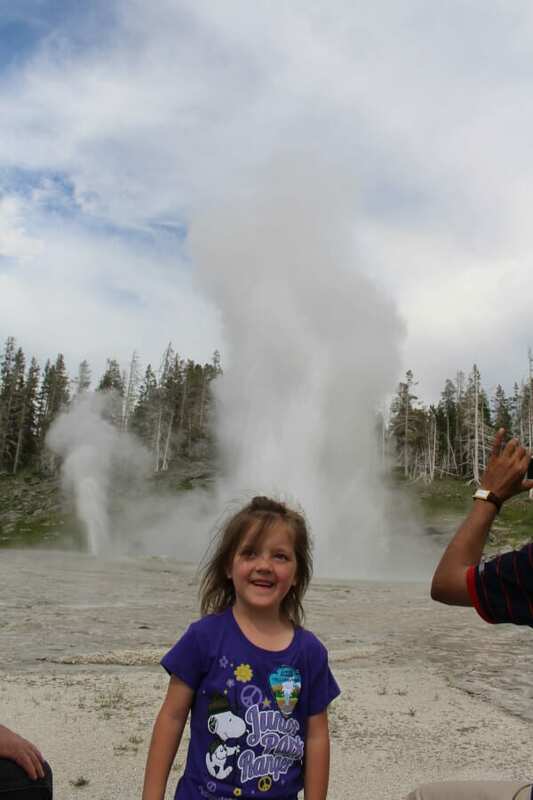 We went to the Old Faithful area for the second half of our Yellowstone vacation. 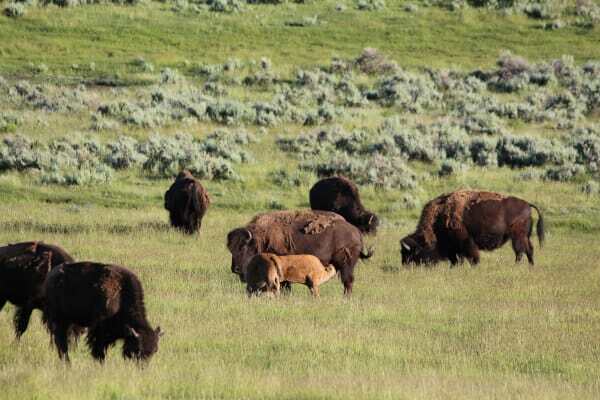 We are also including a few pictures from the Lamar Valley. Here is our post about the Canyons area. 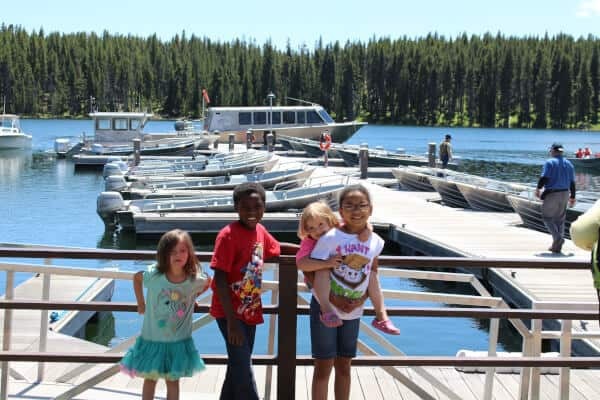 We spent two days in the Canyons area, including the Lamar Valley then stopped along the way from Canyons, spent most of the day at the lake then got to Old Faithful Inn that evening. We stayed 3 nights at the Old Faithful Inn in the “Old House,” which is the old part of the hotel. Full of charm but not a lot of modern conveniences. There was no bathroom in our room, but it was still way better than camping. One evening we drove out to the Lamar Valley from the Canyons area. We ate at the Roosevelt Lodge then drove out to Lamar Valley, which is a big valley with lots of wildlife. We saw thousands of buffalo. They caused a major traffic jam. We were delayed at least half an hour while waiting for lots of buffalo to cross the road. 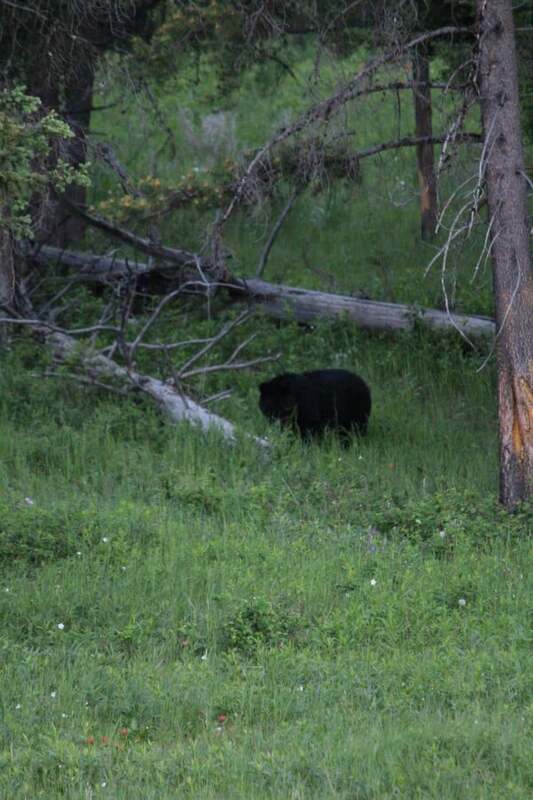 We saw this mother black bear and 2 cubs just off the side of the road at the base of Mt. Washburn just north of the Rosevelt-Tower Junction around 9 pm on our way home from the Lamar Valley. See the bigger boat in the background? That’s the Lake Queen II on Yellowstone Lake. It holds around 30 people and we went on a tour of the lake on it. We stayed at the Old Faithful Inn. 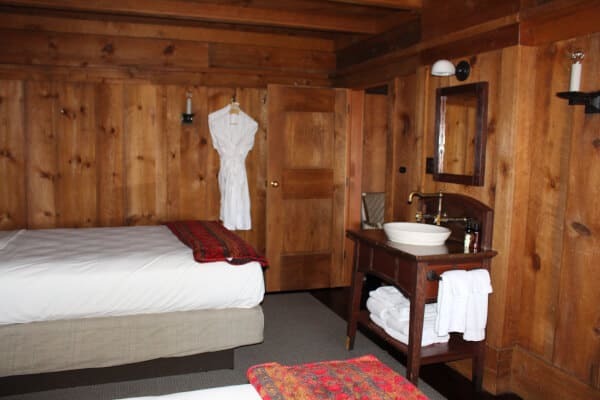 It’s in the old part of the inn and you have to use the bathrooms down the hall, which are nice at least. There is a sink. The decor hasn’t changed much in all the years. Our windows were above the entrance so we had a good view of people coming and leaving and we could see them sitting on the balcony watching Old Faithful. The main problem with the room is that it was very noisy because of thin walls and being so centrally located but the atmosphere was pretty neat. 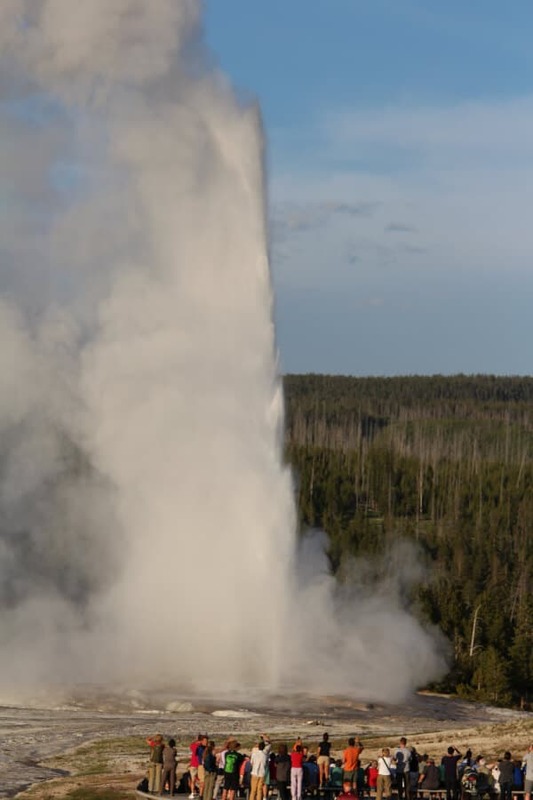 This is the view of Old Faithful going off from our balcony at the Old Faithful Inn. It was really fun to be able to run out of our room a few minutes before it went off and sit on the balance and watch it go off. 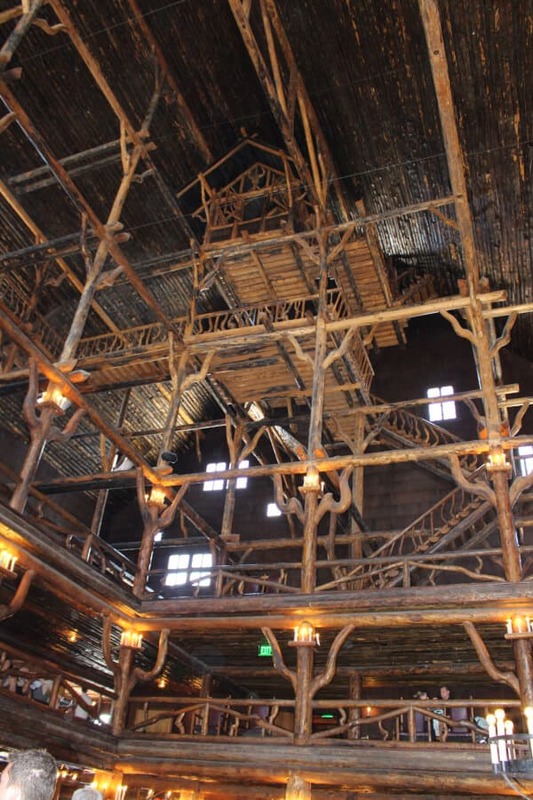 The Crow’s Nest and inside balconies at the Old Faithful Inn in Yellowstone. 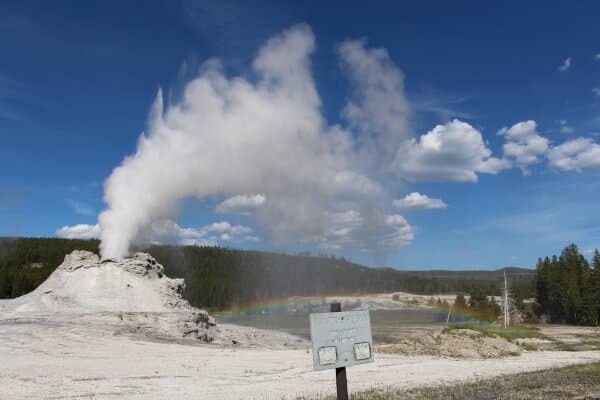 A full rainbow next to Castle Geyser in Yellowstone.